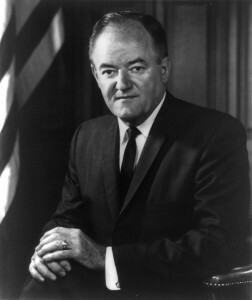 Hubert Horatio Humphrey served as Democratic senator from Minnesota from 1949 to 1965 and from 1971 to 1978. He was the representative of the liberal wing of the Democratic Party, having built his political base on a farm and labor coalition the likes of which had not been seen since early in the 20th century. From 1965 to 1969, he was vice president in the administration of Lyndon B. Johnson, and he ran against Richard M. Nixon as the candidate of a splintered Democratic Party in 1968. Conservatives found him too liberal and, at this time, liberals opposed to the Vietnam War found his continued support of that war unacceptable. Nevertheless, his loss to Nixon was by a razor-thin margin.